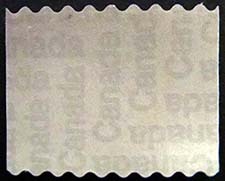 Underprint - A stamp with a logo or company initials printed on the underside of the stamp, intended to prevent unauthorised use of the stamp or as a form of advertising. Canada Post introduced underprinting in November 2012 on selected definitive issues. Unhinged - a stamp without hinge marks, but not necessarily with original gum. Unitrade Specialized Catalogue of Canadian Stamps - specialized stamp catalogue published by Unitrade Associates on an annual basis. Universal Postal Union (UPU) - the UPU or Union Postale Universelle (its official title) originated and was first organized by Dr. Von Stephan of Germany, who convened the first conference of the General Postal Union (as it was at first named) at Berne on December 15, 1874. It was renamed the UPU in 1878. Unused - term that is normally applied to 'mint' specimens, but is equally applicable to one without gum, or to one that has been through the post and missed cancellation. UPU - acronym for Universal Postal Union. See above. Used - implies a stamp postally used, normally cancelled, and in fair to good condition. Used on cover - implies that the stamp in question is on the original envelope, wrapper, label, postcard, or other 'entire', and that it thus displays all the evidence for the philatelist or postal historian. 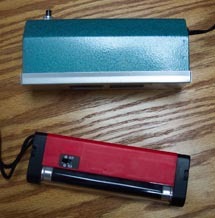 UV lamp - ultra-violet lamp used for the detection of fakes, forgeries and phosphor tagged stamps.